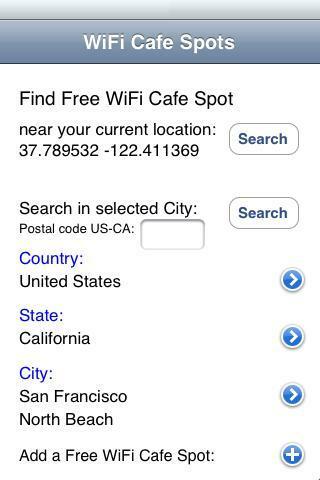 Free WiFi Cafe Spots helps you find a Cafe or Restaurant with a free WiFi hotspot. It lists more than 100,000 Cafes and Restaurants with free WiFi in 140 countries around the World. You can get Free WiFi Cafe Spots also as an Android, iPhone, iPod Touch or iPad app, which stores the location of the Wi-Fi hotpots on your phone, so that you can find them when you travel and do not have internet access. You can list all cafes near your current Geo location or select a City / Neighborhood by name or ZIP code. and many more Cities and Towns in 115 countries around the World. Note: The app can also be used without internet connection and without GPS.